Company also ranks No. 4 as Top Private Arizona Business in Annual Arizona Corporate Excellence Program. We are so proud to be part of this outstanding community, and I can’t think of a better place to have our global headquarters than here in Arizona. It means so much to me to receive this amazing honor from a business community that I respect so much. 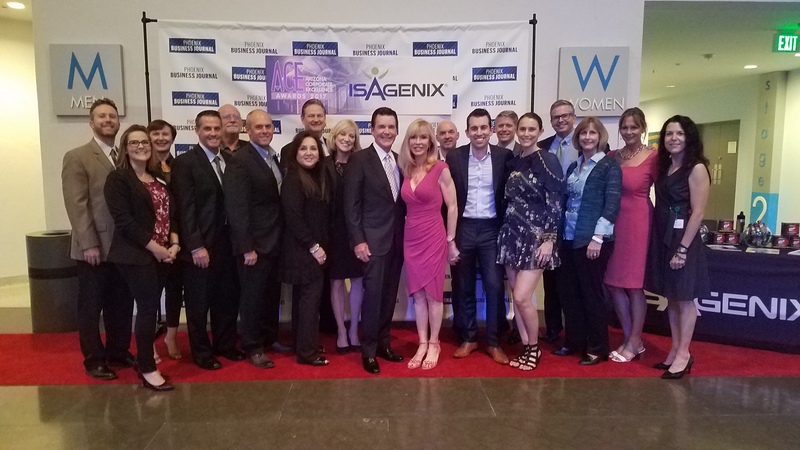 Isagenix International, a global health and wellness company providing nutrition and lifestyle solutions, was recognized at the 2017 Arizona Corporate Excellence (ACE) Awards event as a Top Private Arizona company ranking number four on the annual list. The awards program recognizes companies based on their overall revenue and revenue growth. Isagenix was recently recognized as a 2017 Inc. 5000 Fastest Growing Company for the 11th consecutive year. Isagenix is one of 120 Arizona companies included and one of only four Arizona companies that has made the list for more than 10 consecutive years. 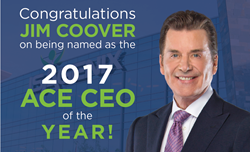 Jim Coover, Isagenix co-founder and chief executive officer was also honored at the ACE Awards event as the 2017 CEO of the Year. “I am extremely honored to accept this award on behalf of the entire Isagenix family,” said Coover. “We are so proud to be part of this outstanding community, and I can’t think of a better place to have our global headquarters than here in Arizona. It means so much to me to receive this amazing honor from a business community that I respect so much." Widely considered a pioneer in the weight loss and nutrition industry, Jim has successfully led several companies, serving more than 7 million customers and exceeding $1 billion in sales. In 2001, Jim and his wife, expert network marketer Kathy, co-founded Isagenix in pursuit of a vision to impact world health and free people from physical and financial pain. Along with their son, Erik, and a world-class management team, the couple remains actively involved in the day-to-day operations in 15 markets across the globe. In just 15 years, Jim has led Isagenix to cumulative revenue of more than $5 billion. Annual revenue for 2017 is expected to reach $1 billion and the company goal is to reach $2 billion in annual sales by 2020. According to ASU’s Seidman Research Institute, the company had a $1.5 billion impact on the 2016 U.S. economy and over $1.1 billion in labor income, supporting 13,444 jobs. The Phoenix Business Journal’s list recognizes top companies in a variety of industries. The publication has recently recognized Isagenix as a largest Corporate Philanthropist, a top Family-Owned Business, and a Healthiest Employer. View the full ACE Top Private Arizona Companies list here. Established in 2002, Isagenix provides systems for weight loss, energy, performance, healthy aging, and wealth creation. With more than 550,000 customers worldwide and more than 100 life-changing products, packs, and systems globally, the company is committed to producing Solutions to Transform Lives™. In 2017​, Isagenix surpassed $5 billion in cumulative global sales through an independent network of associates in the U.S., Canada, Puerto Rico, Hong Kong, Australia, New Zealand, Taiwan, Mexico, Singapore, Malaysia, Colombia, Indonesia, the United Kingdom, Ireland, and the Netherlands. Isagenix is a privately owned company with headquarters in Gilbert, Arizona. For more information, visit Isagenix.com.